Why is Lord Ganesha called as Prathampujya? Lord Ganesha is said to Be Pratham-pujya. Pratham pujya means – one who is always Workshop First. There is Mythological Ganesha Story behind this Deity. Once All Demigods discuss as Who is Superior among us. After lots of discussions when no was no conclusion, all demigods went to Lord Shiva for a final decision. On this Lord Shiva said: One who takes a complete leap of this Universe (Prithvi, Aakash and Paatal ) and comes to me at earliest – will be declared Winner and to be honoured as Pratham-pujya. All demigods went along with their respective vehicle to take a complete round on Universe. Lord Ganesha saw that he has a MOUSE as their vehicle and won’t able to complete this race. Hence, he acts smartly and takes 3 round ( Parikrama) around his Parents – Lord Shiva and Parvati. He ( Ganesha ) considered Shiva and Parvati as Complete Universe is infused in them hence after complete 3 round he sat on this throne. When Kartikeya who came from the race, saw Ganesha sat down on throne with smile, he ( Lord Kartikeya ) in fit of anger – throw weapon on Ganesha – due to which his ( Ganesha ) One tooth get broken, hence he was then called now as Ekdanth ( Lord who has one broken tooth ) . When all the demigods arrive on the spot saw Lord Ganesha and they were thinking as of how he arrived first. On their questions – Ganesha smartly replies as of how Shiva and Parvati is a complete Universe and praying to them make him WINNER. On his smart reasoning – all demigods including Lord Shiva and Parvati declared Lord Ganesha as Head among of all ( Gana-Daksha) and Pratham-pujya. NOTE: Gana-Dakshya means the Head of the GAN ( Masses- Human ). Hence we have termed as Jan- Gan – Man in our National Anthem. Another reason to called Lord Ganesha as Pratham-pujya because he has the following 13 qualities which we all have to adapt to become Pujya ( mean respectable people in society). Big Head – It depicts Knowledge and Wisdom. Lord Ganesha is said to be the wiser person in the Universe. He is said to be the Treasurer of Knowledge. In today’s internet Era – where every person is engaged in so many works – s/he has to update with the knowledge of his/her field to lead ahead and stay progressive. Big Ear – It depicts Listening qualities. So if you want to be a successful person – you should be a good listener as it not only helps you in understanding the other person but also helps in acquiring the knowledge from the other person(s). Trunk-It depicts The High Dignity in Society. Also, it says that a person should be very much alert and sensible to people and always understand the upcoming danger through its strong senses ( Smell ) – Mean Intuition. Small Mouth – depicts to speak less only and one should only open his/her mouth whenever there is a necessity. This also tells us to save our energy by not speaking and saving those energies. Small Eyes – Eyes are said to be Soul of the human being. Hence eyes always speak the truth. 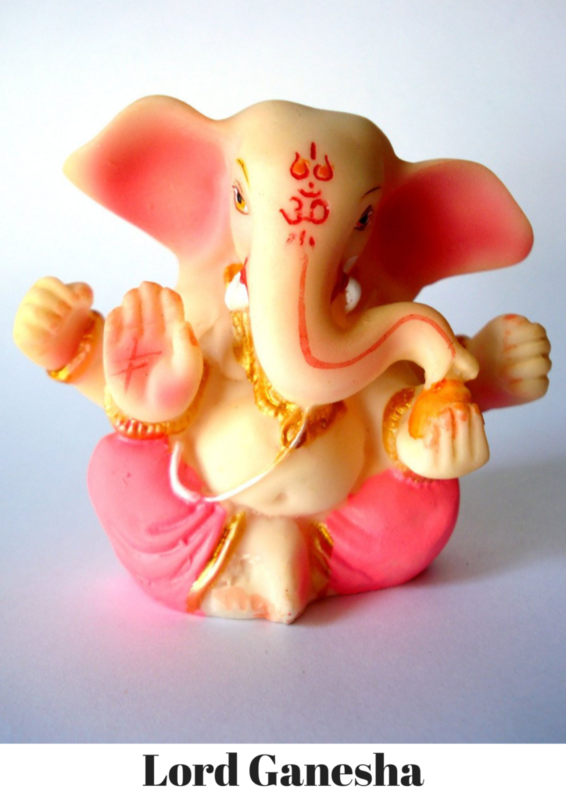 Here –Shastra says that those have small eyes like Lord Ganesha are a focus of his/her life and also have high concentration power and WILL in his/her work. In face reading – the small eyes also depict smart and introvert personality. In a way – these small eyes of Shri Ganesha depict to engrossed yourself in work wherein he gets indulged so much in his/her project that s/he will definitely get Succeed. Broken Tooth ( Ek-danth ) – Firm Determination in your daily action and goal. Ek-danth also said to that personality those words and action are matching – in a way – it depicts Honesty of an individual. So, Lord Ganesha depict the Inner self and Integrity. 4 Hand – Sham, Dam, Danda and Bhed – This the phrase said in ancient India and still many people used this language to complete their work by hook and crook. Hence 4 hands of Lord Ganesha depicts the smartness of person who knew how to make the other people work and complete on assigned time. 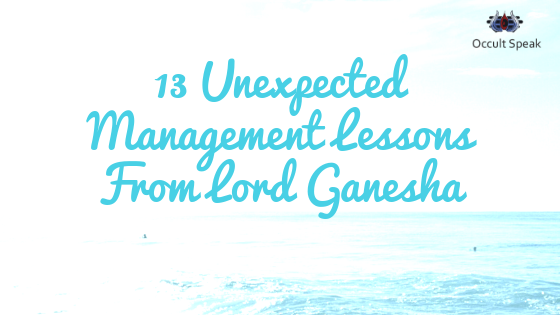 Hence these qualities of Ganesha – depict Management Mantras which state how a leader should behave in his/her personal and professional zone. This again depicts the creativity of individual how s/he can effective in dealing with the people. Parshu ( Weapon of Ganesha ) – This means Dare to says NO to people. We as a human being sometimes unable to say NO to other people thereby leads to Frustration and anger. 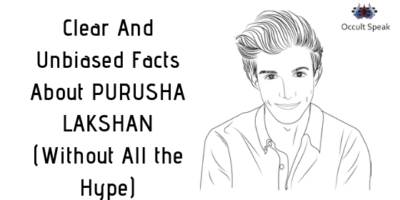 Hence Parshu means to be the straightforward attitude. One should not be Backstabber either be very humble to accept all the work from other people which you are not willing to perform. Parshu also depicts Punishment to enemies. READ : Why we celebrate Navratri ? Varad Mudra – Lord Ganesha one hand is in Varad Mudra – Aashirwad Mudra which shows auspicious thinking pattern for self and other(s). Hence been human it is our duties to always thinking right and take action in positives manner which affects not only to self but to complete society. Big Tummy – This shows Good appetite and high level of digestion power not only on the physical level but also a good maturity on a mental and emotional level. The big stomach also mean to be secretive in nature wherein if you are secretive then people will trust you in revealing their talk/secrets to you. Vidna-Nashak – Lord Ganesha is said to be Vidna- Nashak mean who destroy their enemies. Here enemies are referred as to your internal enemies of mind, body and soul. Eg: Lust ( Kaam), Krodh ( Anger), Lobha ( Greed), Moha ( attachment), Ahankaar ( Ego). One who defeats this internal enemy is said to be the Leader and Winner of Universe. Modak – Priya – On one hand – Lord Ganesha holds Modak ( Swedish ) which depict joyful nature and s/he should always celebrate in their life no matter what the situation is? Whether the celebration is small or big, we should always celebrate by eating Sweet in Lunch and Dinner and serve to people to expand our inner joy. Mushak-Sawari ( Mouse ) – This depicts that one should be enough capable of handling the manpower ( here it depict the Managerial Skills of Leader/humans), no matter whether the person is a celebrity OR a poor person/Clerk. Let me know how you find this blog ?